Five members of a sophisticated drugs gang which plotted to produce huge quantities of cocaine in the Wigan area have been jailed for a total of 46 years. The ringleader Adam Perks - who is on the run - had arranged to bring in cocaine from Mexico with a potential street value of £5m in two shipments. And despite police raiding the gang’s lock-up unit in Ashton-in-Makerfield where cocaine powder was being pressed they went on to arrange a further substantial shipment. This involved hiding the drug in a shipment of coffee beans - to disguise the smell - from California to Felixstowe, said Alaric Bassano, prosecuting. Perks’ right hand man, Martin Fish, was among those who travelled to Felixstowe to secretly extract the illegal consignment from the container and then seal it up again. But today 30-year-old Fish, of Bell Lane, Kitt Green, was starting a 12-year sentence as was Perks’ twin brother Simon Perks, of Sefton Road, Orrell, Wigan. Liverpool Crown Court heard that 40-year-old Perks has two previous convictions in 2007 and 2010 for possessing cocaine with intent to supply. Fish and two men involved in pressing the cocaine in the lock-up unit, Gore, 37, of Scot Lane, Newtown and Anthony Jenkinson, 35, of Inward Drive, Shevington had pleaded guilty to conspiring to produce cocaine. 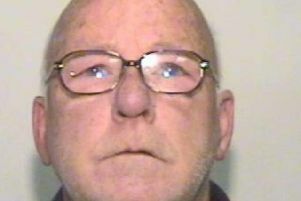 Perks and his trusted friend Christopher Thompson, 41, of St Wilfrid’s Road, Standish, both denied the offence but were convicted last week after a trial. It was Perks’ mum’s funeral today and Judge Steven Everett had offered to delay sentence so he could attend but he declined as he did not want to be there accompanied by police. Thompson was jailed for 10 years and Gore and Jenkinson each received six years. Judge Everett told the men “you were all involved in this evil drug cocaine” and that Fish, Perks and Thompson were close to the importation. He said it was clear that Adam Perks was at the top of the management chain and had been involved in discussions with at least five cocaine suppliers in South America which led to 20 kilos of cocaine being smuggled into the country in two importations in 2013. That would have been diluted to make 100 kilos bringing misery to the streets of the North West and beyond. “Foot soldiers” Jenkinson and Gore were arrested after police raided the lock-up unit in Pretoria Road, Ashton on March 28, 2014 and two presses, 146 grams of cocaine and adulterants were seized. When Gore’s home was searched eight grammes of cocaine was found containing the same adulterant. Judge Everettt said that at least five kilos of the imported cocaine had gone through their hands though only they knew how much. Despite this raid Adam Perks continued with his drug trafficking operation and In April, May and early June that year he bought chemicals used to extract cocaine hidden in coffee and they were delivered to his twin’s home. On May 30, 2014 Fish sent him a message talking about the imminent arrest of a dealer who was likely to be out of action for some time and they “evidently expected to have sufficient drugs to take advantage of this opportunity,” said Mr Bassano. The next month the container arrived at the port of Felixstowe and Fish, who had bought another press and hid it at the home of his unsuspecting parents, went to Felixstowe to help recover the cocaine from the container as did Thompson and the Perks brothers. Text messages referred to the fortune that was going to be earned and to the complicated process needed to extract the drug from the beans. When the home shared by Fish and his girlfriend, Stacey Heath in Prescott Lane was searched they found a makeshift laboratory, the chemicals and products needed for the extraction process. In a later message Fish told Heath, “Job sorted babe, ha u can have ur ear rings.” He also told her they were “made for life”. When the press was found at his parent’s home during raids a few days after their return from Felixstowe there was evidence it was already in use. Heath, 33, of Prescott Lane, Orrell, denied involvement in the plot and was cleared by the jury. Adam Perks had been arrested in November 2013 but there was then not enough evidence to prosecute him and in June the next year he flew to Colombia and still believed to be abroad. In mitigation the court heard today that Fish has two children and had pleaded guilty. He was described as a hard working father of two with no similar convictions. Andrew Scott, defending, asked the judge not to impose a sentence which would extinguish hope for Perks. The court heard that both Gore and Jenkinson are family men, Gore having no convictions and Jenkinson’s only for motoring offences. Judge Everett expressed amazement that they had got involved and said he accepted they bitterly regretted their involvement.